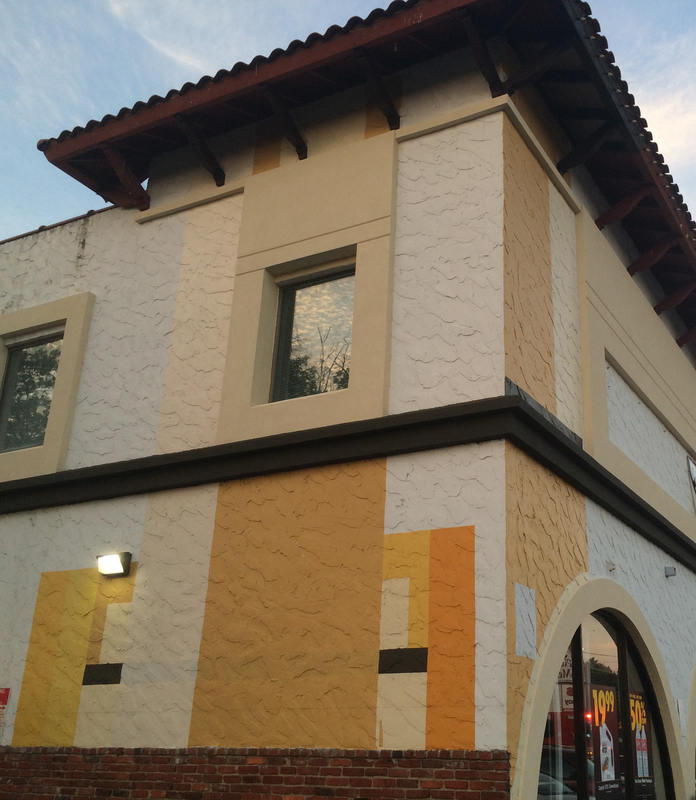 More than 5 years after Giant Food closed it’s doors, Plaza Del Mercado is getting a face lift. As announced by Federal Realty almost a year ago, two new anchor tenants have committed to the space formerly occupied by Giant: LA Fitness & Aldi Grocery Stores, and construction is well underway. This is welcome news to Layhill residents, and that is an understatement. It seems like yesterday that a petition for Trader Joe’s to replace Giant swept the area and had us all dreaming about what could be. In reality, Trader Joe’s and many other grocers turned down the space very early on (Trader Joe’s, for instance already has two stores in Rockville and Silver Spring, and they aren’t a “store on every corner” retailer). We’ve had fly-by-night furniture stores with their tacky road signs, a seasonal Halloween costume store, a make-shift kids’ entertainment space, and a general sense of confusion and despair to go along with them. But now, it seems, we can breath a sigh a relief. The Aldi Grocery Store, the exterior of which can be seen today, will stand to the left of the former grocery store, in the space occupied by the former bank and a couple other shops. On the right, where Giant once stood, LA Fitness will be built: a 37,000 square foot, state of the art fitness center on two floors, rumored to house a swimming pool, and A direct competitor to Gold’s Gym (formerly Fitness First) in the Layhill Shopping Center up the hill. No opening dates have been made public, but expectations are for an end of 2016 opening for Aldi and early 2017 opening for LA Fitness. 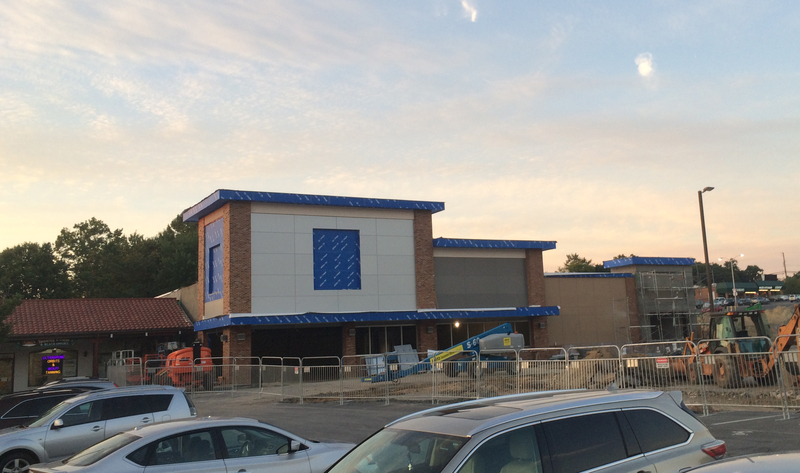 In addition to these new stores, the facade of Del Mercado is being renovated, with new architectural details and a new color palate on the way (pictured left is likely a test by the designers and a preview of what color combinations we can expect), new and coordinated store signs will be installed, improved outdoor gathering and seating areas are planned, and the parking lot will be renovated to include more greenery. All of this, and Federal Realty’s focus on securing other long term, retail tenants, means that our wait is almost over. The days of dollar stores and Layhill Road sign holders (remember the Verizon people in the median??) are behind us, and the potential for more shopping and dining in our own “town center” are ahead. It’s been 5 years, and I know I should have learned to be patient with this process by now, but I cannot wait to see this complete. The lights, the convenience, and all of us with our smiling faces, finally enjoying this tucked away, neighborhood shopping center again. And hey, how about a boost to home values in Layhill?